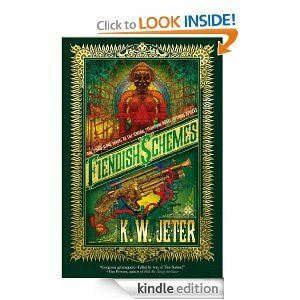 Wonderful and delightfully well-written steam punk novel, which envisions an alternative past of steam power instead of internal combustion. Steam robots abound, fiendish schemes, sentient oceans which move where they want, walking, steam-powered lighthouses (made necessary by wandering sentient oceans) and all kinds of wildly imaginative devices set in in Britain in an alternative past of about 1880 – 1900. Set in the later part of the last century, the author, K.W. Jeter, writes not only in the flowery vocabulary of the time, but also expressing much of the prudish and luddite sentiments, as wells as the decadent aristocracy, and the ‘coal-baron’ mindset. … A palpable fear flooded the space, pervasive as the gaseous fumes and clouds of vapour, directed toward the iron doors as they began to ponderously swing open. The unadorned cylinders of their hinges groaned with the tonnage of the bolted metal. From the space revealed beyond, a more forceful gout of steam rolled outward, churning as those great thunderheads in a darkening sky which promise storms so violent and cataclysmic as to wrench oaks from the stony ground and transform placidly meandering rivers into torrents tumbling ancient bridges into their foaming waters. The timid figures scrambled toward the sides of the chamber. Their doing so made a crucial revelation to me, by which I was at last able to hazard a guess as to the exact designation of the place to which I have been so dangerously guided. The daunting impression upon my thoughts and sprirts was inevitably magnified by this apparition’s size. There was a roughly centaur-like ration between the iron-bound locomotive component and what remained of softer flesh and bone. The seemingly human lineaments were dwarfed by the engulfing mechanical parts, so that the face and upper torso appeared as no more than those figureheads adorning the prows of the Royal Navy’s greatest warships. Underneath such a bulk, the timbers of the chamber’s floors creaked and swayed, the parallel iron tracks kept from buckling and collapsing entirely only by the bridge-like girders which had been rigged in place beneath, visible through the broken gaps revealing the underlying cellars. As appalling as the constructions size might have been, as though a railway engine had burst through the wall of some miniscule village ship, and the dismaying proportion of metal to the whole, the perceptible transformation of the human fragment was even more repellent. Through the enveloping clouds emitted by the valves and connectors riveted to the gargantuan boiler, at its front was a visage barely recognizable as what might once have been a woman’s, its square-cut jaws rendered even more cruelly androgyne by the surrounding steely cast. The features seemed more chiseled into place by some diabolical ironmonger than by Nature’s hand. Its eyes were but slits, the spark of feminine wiles visible through them as sharply focused as those of an infantry sniper taking aim from a fortified position. I would not previously have thought it impossible, but my fears had vaulted past their previous boundaries impelled by the apparition below. Even so, as that which terrifies us the most still forces our scrutiny, I found myself compelled to direct my stricken gaze toward the monstrosity. Legions of uniformed attendants swarmed across its flanks with swan-necked oil cans and grease-blackened rags, much as smaller fish are described by ichthyologists as grooming the toothily smiling bulk of a shark capable of devouring scores of such devotees with a single sweeping gulp. Stonebrake smiled as he spoke his answer. It mattered little that I could barely hear him through the stifling din, as I had been told once before that name by which the appalling creature was known. Its designation had been spoken to me once, mysteriously at that time.